The community is invited to attend the upcoming LaPESC Lafayette Parish School Board candidate forums to learn more about the views of school board candidates on key public education issues. Twenty candidates have qualified for the school board election, with every district qualifying at least two candidates. "The forums are a key strategy in ensuring that the community is provided an opportunity to hear from all candidates on how they stand on crucial issues such as increasing student achievement and preparedness in our community," shared Stephen Bartley, Chairman of LaPESC. "It is LaPESC's hope that these forums build community engagement and support for uniting in a common set of community principles and priorities for public education as the November 4 election quickly approaches." Additionally, each forum will broadcast LIVE on Acadiana Open Channel (AOC) (Cox 16/LUS 4) and will replay numerous times leading up to the election, in order to provide candidates with extensive coverage and community members with multiple opportunities to become informed about all candidates who are running for school board. The following is a list of qualified candidates for each district. More information about candidates is available on the Louisiana Secretary of State's web site. With school board elections approaching this fall, a growing coalition of community organizations is partnering to advance a specific, student-focused vision for public education. A recently unveiled initiative — a Common Vision for Our Future — translates the community's aspirations into a framework for action that articulates principles and priorities for moving forward. We have an opportunity to end the current dysfunction on our school board by rallying around a set of principles and priorities that are based on increasing student achievement and preparedness. Read more about the Vision at commonvisionlafayette.org. 3. Mark the November 4th election on your calendar and ask School Board candidates about their support of the Common Vision and their plans to get it implemented. Please join LaPESC for its first “ED Talks” on Wednesday, July 9 from 6:00pm to 7:00pm at Acadiana Open Channel located in the Rosa Parks Transportation Center at 101 Jefferson Street, Ste. 100, Lafayette, LA. We will focus on the current state of education after the recent 2014 Legislative Session. The event will be televised live with the assistance of AOC. Our guest speakers include Barry Erwin, President and CEO of the Council for a Better Louisiana (“CABL”), Dr. Willie Smith, Vice Chancellor for Economic and Workforce Development at South Louisiana Community College (SLCC), and Laci Maniscalco, Common Core Advocate trained by Student Achievement Partners, Louisiana Teacher Leader, Advisor with the Louisiana Department of Education and 3rd grade teacher at Broadmoor Elementary. Space is limited so please RSVP to jan@upperlafayette.com or call (337)769-7649 to reserve a spot. LaPESC and several of its partner organizations hosted a series of moderated round table discussions focused on public education. Participants had the opportunity to share thoughts, ideas and opinions directly with community stakeholders. The discussions focused on developing community priorities for the 2014 Lafayette Parish School Board elections, which included school system governance, Lafayette Parish School Board Turnaround Plan - 100% In, 100 Out, facilities and equipment, Common Core and Charter schools. Many thanks to the Greater Lafayette Chamber of Commerce for organizing and manning each of the meetings. Partner organizations in this effort include the705, 100 Black Men of Greater Lafayette, the Community Foundation of Acadiana, Concerned Citizens for Good Government, the Greater Lafayette Chamber of Commerce, the Greater Southwest Louisiana Black Chamber, the State of Greater Black Lafayette and Upper Lafayette Economic Development Foundation. I am a 45 year resident of Lafayette Parish. I live in a segment of the parish that is called North Lafayette. Every North Lafayette public school that our children are zoned to attend is low-performing. We have the highest poverty rates. Our North Lafayette public schools are mostly children of poverty who are mostly African American. For well over a decade, our schools have chronically under performed. Student expectations have been low. Rigorous academic achievement has not been part of the school culture. I graduated from the local public high school and so did all four of my children. I now have grandchildren who attend public schools in Lafayette Parish. As a grandparent of public school children, I am excited about the new academic standards that our public school students are expected to achieve. The Common Core Standard will mean increased rigor for students which will make them better prepared for college or a career. We are hopeful that these higher standards, that will be measured using new nationally normed assessments, will motivate our school system to raise expectations of all children in the district, including those in North Lafayette. I understand that our nation ranks seventeenth (17th) in education among industrialized nations. Our state ranks forty-ninth (49th) in the nation. My parish ranks twenty-second (22nd) in a state that ranks forty-ninth (49th) in a nation that ranks seventeenth (17th). To make matters worse, schools in North Lafayette are ranked at the bottom in a district whose performance is mediocre by state standards, standards that rank at the bottom in the nation. For our children’s sake and for the sake of our state, WE NEED MORE RIGOR. Increased rigor translates to higher expectations. We must expect more of our children to graduate from high school on grade level and to achieve college-ready scores on the ACT. The third (3rd) grade literacy rate at the elementary school in my local community is only thirty-six percent (36%). State referenced LEAP tests show that 74% of fourth (4th) grade students in our state are able to read on grade level. When nationally normed assessments are used the proficiency rate drops to a low of twenty-three percent (23%). Our students are falling further and further behind when compared to their peers nationally and internationally. What my neighbors and I have considered low-performing is even worse when compared to national and global standards. I believe that our students can meet the higher expectations of the Common Core Standard. The twenty-first (21st) century economy demands that we expect more of our children. All children can learn, no matter their race or income. For children to meet the new standard adults in our state must first believe and then expect that they can compete at the national and global level. My grandson is in second (2nd) grade. This school year homework is more challenging for him, his parents and his grandfather. While homework has become more difficult, it is very clear that the new curriculum that has been adopted by Lafayette Parish, to meet the Common Core Standard, will help my grandson become a critical thinker. I am more confident than ever before that he will graduate college ready. Education is the new currency for the growth of the middle class. Our quality of life and the stability of our neighborhoods require more children graduating from high school, attending and finishing college, and then competing for the high paying, high demand jobs that make up our workforce. For some of the high demand jobs, college readiness is necessary. For others, career readiness is required. By meeting the Common Core Standard, Louisiana’s students will be both college and career ready. As we move forward with the implementation of this new globally competitive standard, Louisiana citizens must take the time to study the facts about Common Core. As we move closer to next year’s legislative session, there will be attempts by a minority of Louisiana citizens to roll back this very important education reform initiative. I encourage parents, grandparents, business leaders, civic leaders and religious leaders to become politically engaged and active in this debate. We cannot allow a vocal minority to keep our state at the bottom in student achievement when compared with other students in the nation and the world. Louisiana must continue its movement to join the family of industrialized nations where student readiness in math, science and reading positions children for successful global competition. The facts of the Common Core Standard clearly indicate that it is not a government takeover of the classroom, local school districts or state departments of education. Common Core is the standard that articulates expectations by grade level. It is not a curriculum. Local districts are responsible for the curriculum that meets the Common Core Standard. To put it simply, CCS articulates what is expected of students as they move from grade level to grade level, putting parents, teaches, local administrators, school boards and state administrators on the same page with each other and the rest of the world. The curriculum will be rigorous so that student achievement makes the standards reachable. It will require a greater investment of time from students, parents and grandparents. The upside will be more of our children graduating from high school ready for college or ready for a promising career. As a grandparent, I am excited about the new standard. I encourage Louisiana citizens to fight any attempts to roll back our standards to where they were, which have been mediocre and unsuccessful in preparing our children for global competition. Lafayette, LA – A local team received leadership development training that will enhance efforts to bring innovative and useful solutions to the community through their work around education. 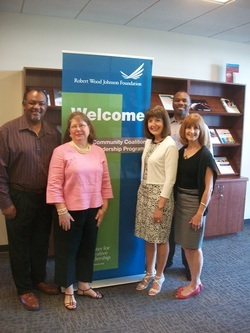 A grant awarded to United Way of Acadiana allowed for Lafayette Parish Public Education Stakeholders Council (LaPESC) team members and their coach to attend the Robert Wood Johnson Foundation (RWJF) Community Coalition Leadership Program in San Diego June 24-28. The Center for Creative Learning, a top-ranked, global provider of executive education that develops better leaders through its exclusive focus on leadership education and research, facilitated the training. Team members, their professional positions, and respective organizations they represent in LaPESC, include Trahan, with United Way of Acadiana, Rev. John W. Milton, Esq., pastor of Imani Temple #49, with State of Greater Black Lafayette; Stephen Bartley, agent with New York Life, with Greater Southwest Louisiana Black Chamber of Commerce; and Stella C. Theriot, district director of Junior Achievement of Acadiana, with the Greater Lafayette Chamber of Commerce. Lise Anne Slatten, Ph.D., business professor at the University of Louisiana at Lafayette and non-LaPESC member, is the team’s coach. The team’s focus over the next year is to plan strategic leadership actions for the coalition. Along with six teams from around the country, the LaPESC team participated in developing boundary-spanning leadership activities to increase self-awareness in order to improve their ability to work collaboratively with others and lead transformational change within their communities. Slatten learned relevant team coaching tools and how to improve the team’s and coalition’s effectiveness. The team and their coach will end their yearlong leadership learning experience with a two-day program at the RWJF campus in Princeton, N. J. During this event, they will share the results of their collaborative work, solidify lessons learned, and develop a plan for using what was learned to engage in more coalition-based efforts in their respective communities. The Lafayette Parish Public Education Stakeholders Council (LaPESC) is a coalition of independent education stakeholder groups with a common commitment to improve overall academic achievement, to eliminate the achievement gap and to increase the high school graduation rates of all students. The objectives of LaPESC shall be to identify the roadblocks to educational attainment for children living in poverty, who are mostly African American, and to advocate for solutions to those barriers. LaPESC’s vision is to ensure a world-class education for every student in every public school with sufficient resources to unlock their transformative abilities so that 100% of our students reach their full potential and graduate from high school prepared to succeed in post-secondary education. Members of LaPESC value diverse perspectives, shared leadership, open dialogue, accountability, partnership, alignment, transparence, integrity, inclusiveness, communication, and trust. The Lafayette Parish Public Education Stakeholders Council on Friday urged the Lafayette Parish School Board to reconsider its investigation of superintendent Pat Cooper. It called for the school board to call off its investigation and get behind Cooper’s six-year concept for the district. “(We) believe that effective governance practices should be a reflection of the Lafayette Parish School Board’s overall commitment to ensuring excellence in education for every student,” the statement said. The school board on July 17 hired a Gretna law firm to probe unspecified allegations against Cooper. The stakeholders council is comprised of 13 organizations, including the Citizens Action Council, the United Way of Acadiana and the Greater Southwest LA Black Chamber of Commerce. It is the latest group to speak out against the move. Last week, the Greater Lafayette Chamber of Commerce issued a statement supporting Cooper’s plan. The stakeholders council encouraged board members and Cooper to work together and with others, including parents, faith-based organizations, business networks, ad non-profit organizations for the common good. “To continue with an investigation removes focus from children and will cause further damage to the working relationship between the board and the superintendent,” the statement read. The coalition of independent civic groups working to improve public education in Lafayette Parish has increased its membership with the addition of three new member organizations joining the Lafayette Parish Public Education Stakeholders Council. According to LaPESC President Margaret Trahan, executive director of LaPESC member organization United Way of Acadiana, the number of groups representing LaPESC is now 13: United Way of Acadiana, 100 Black Men of Greater Lafayette, Citizens Actions Council, Concerned Citizens for Good Government, Greater Lafayette Chamber of Commerce, the Greater Southwest Louisiana Black Chamber of Commerce, State of Greater Black Lafayette, The705, University of Louisiana at Lafayette, the Lafayette Parish School System, the Lafayette Parish Sheriff’s Office, the Pugh Family Foundation, and the Upper Lafayette Economic Development Foundation. The sheriff’s office, the Pugh Family Foundation and the Upper Lafayette Economic Development Foundation all joined LaPESC this year, which brings the collective membership of the group to more than 6,000 stakeholders. The other 10 civic groups and agencies are founding members of LaPESC, though the Lafayette Parish School System withdrew its membership when LaPESC began planning candidate forums for board elections (LPSS actually announced its withdrawal to the media before letting LaPESC know it was pulling out). The school system rejoined LaPESC soon after Lafayette Parish School System Superintendent Pat Cooper took over as head of Lafayette Parish public schools. LaPESC members have played a critical role in bringing in a qualified superintendent, and they’ve also served on Cooper’s 10 task forces that crafted his proposed six-year district turnaround plan. The Lafayette Parish Public Education Stakeholders Council is a coalition that represents 5,000 external stakeholders of Lafayette Parish Schools. Members include the Greater Lafayette Chamber of Commerce, UL Lafayette, 100 Black Men, United Way of Acadiana, State of Greater Black Lafayette, Concerned Citizens for Good Government, Citizens’ Action Council and the Greater Southwest LA Black Chamber of Commerce and the 705. In addition, LPSS was a founding member of LaPESC. LaPESC fully participated in the initial interviews of the ten finalists for Superintendent of Lafayette Parish School System. We noted that many of the candidates acknowledged the need to reduce the achievement gap, improve academic achievement, reduce the number of dropouts and to improve overall cohort graduation rates. We listened to the interviews to learn who most closely reflected our core beliefs. LaPESC believes that a district superintendent’s actions must always reflect that all students are entitled to a quality education and that every student can learn at high levels and graduate from high school on time and at grade level, regardless of gender, race, class or religious affiliation. LaPESC members have developed a list of competencies, which are attached, and we considered those competencies in narrowing the candidate pool to the final three candidates for the position. Dr. Pat Cooper has been a leader in educational innovation in Louisiana and Mississippi. He is a sought-after speaker and educational consultant. He is a recognized expert in a birth to five program model for school readiness. His work in the McComb school district is inspirational, having demonstrated there that regardless of socio-economic factors, parental involvement or ethnicity, all children can succeed. He also engineered a turn-around in West Feliciana, and this district today continues to be one of the top-rated districts in Louisiana. The creation of the Mahalia Jackson Center in New Orleans post Katrina demonstrates his continuing commitment to a holistic approach to meeting the needs of children and their families in support of educational rigor and results. The Center is also a model of true community collaboration, involving government, non-profits, faith-based organizations, neighborhood leaders and the school system. A graduate of the renowned Broad Academy, Dr. Maria Pitre-Martin has Lafayette Parish roots, but has worked for the 7th largest school district in Texas and is working at the state level currently in North Carolina. She came across as personable, thoughtful, poised and focused. Her 90-day entry plan included extensive community outreach and a focus on improving public trust and confidence in LPSS. Her powerpoint was one of the best, and she had clearly done her homework on Lafayette Parish Schools. Dr. Donald Aguillard has an impressive record as the current superintendent for St. Mary Parish. That parish has seen steady growth in school performance scores and in a narrowing of the achievement gap. St. Mary is similar to Lafayette Parish in that both are currently ranked as “C” districts. His presentation was very well done. He came across as confident, relaxed and very approachable. It was what one civic group leader called a “groundbreaking” moment at the Lafayette Parish School Board meeting Wednesday night when the board voted 5-3 to add to its superintendent selection committee a representative from the 100 Black Men of Greater Lafayette and the Lafayette Parish Public Education Stakeholders Council. Board member Hunter Beasley proposed that a representative from each of the organizations team up with the nine board members in making a recommendation on narrowing down the superintendent search to 10 applicants. Once the board approves the top 10 applicants, the two reps from the civic groups will no longer sit on the panel. Board members Tehmi Chassion, Kermit Bouillion, Mark Cockerham and Shelton Cobb joined Beasley in supporting the new additions to the committee. But Beasley’s proposal was met with some expected opposition from board members Tommy Angelle, Rae Trahan and board President Mark Babineaux. Their no votes offer yet another exhibit of a 5-4 split among board members when it comes to critical reform issues facing Lafayette Parish schools. Board member Greg Awbrey, who often sides with Trahan, Angelle and Babineaux, was absent. In an e-mail response, Babineaux declined to participate, calling the issues listed “agenda-oriented” and “blatant propaganda.” He added that the list was not a “fair and accurate assessment of realistic expectations” for a superintendent, that many decisions are out of the board’s and the superintendent’s hands, that he strongly opposes charter schools, and that everyone is welcome to participate in the board-sponsored community forums and online surveys. Starting at 6 p.m. Thursday at Thibodeaux Career and Technical High School, residents are invited to give their take on what they want to see in a new top schools administrator during the first of six public forums to be held at each of the district’s high schools.